"This recipe is a surefire way to eat right, feel good, and maintain a light midsection while most importantly getting full. It's the perfect bourbon-glazed combination of good fats from fish (protein) and green veggies, leaving out starch to minimize carbs." Rinse asparagus under cold water and snip off the bottom of each sprout. Dry with a paper towel and lay flat on a baking sheet. Rinse salmon; pat dry with paper towels. Lay salmon face-up on a separate baking sheet. 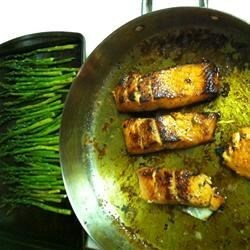 Drizzle olive oil over asparagus; season with salt and pepper and rub through and around the asparagus. Bake asparagus in the preheated oven, turning over halfway, until lightly browned, about 20 minutes. Rub about 2 tablespoons brown sugar over the salmon. Drizzle 1/2 the bourbon over salmon. Let marinate, 15 to 20 minutes. Melt butter spread in a medium nonstick pan over medium-low heat. Add the remaining brown sugar; stir to dissolve. Add salmon fillets; cook until fish flakes easily with a fork, 5 to 7 minutes per side. Pour in the remaining bourbon during the last 2 minutes of cooking. Serve with the asparagus. You can use unsalted butter in place of the non-dairy version. If you have thick pieces of salmon, place the pan from the stove into the oven for 5 minutes to ensure the inside of the salmon is cooked thoroughly.